"Suzanne Romaine's Communicating Gender is an outstanding accomplishment: It elucidates the centrality of language and sociolinguistic analysis to the study of gender and it does so by creating what she calls a 'dialogue across disciplines'….she brings her vast knowledge to the study of gender, offering a comprehensive and in-depth account, as rich in theory as it is in empirical evidence, of how gender is communicated….For teachers of courses that treat gender issues, Communicating Gender will prove invaluable. The book offers widely ranging, rich, and instructive illustrations, including descriptions and critiques of theoretical positions, experiments, case studies, and other first-hand observations. I highly recommend Communicating Gender for the advanced undergraduate, for graduates, and for any scholar interested in a sophisticated analysis and overview of gender communication." "…the hallmarks of this book are its cross-disciplinary, cross-linguistic, and cross-cultural foci….This makes the text suitable for limitless classroom situations….The book may become further invaluable as an introductory text in many universities' current general education courses." "…a very comprehensive, ambitious overview of a topic of much current interest. Drawing on an impressive number of studies, the book could be a good reference or textbook for a women's studies or sociolinguistics course." "Suzanne Romaine's book Communicating Gender is, quite simply, a masterpiece. 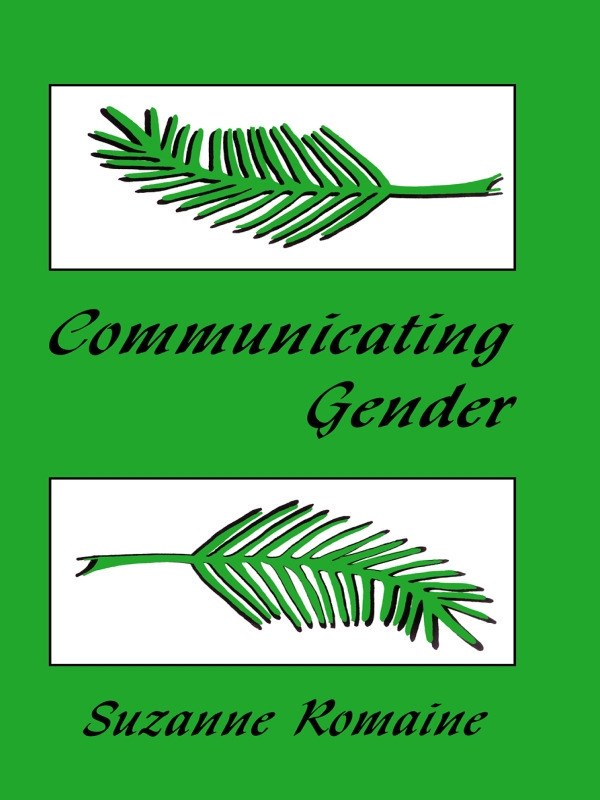 Throughout the 11 chapters the author provides a comprehensive account of how gender is communicated and how it is marked in language, showing how gendered language practices are learned and how they reveal underlying assumptions and beliefs. Romaine discusses all the relevant gender and language-and-gender research of the past decades, putting it into wider contexts. In particular she should be praised for her universal perspective, for she draws on an extensive body of data from all over the world, avoiding the usual Anglo-American dominance. The book is learned as well as well-written, making it a happy 'must' for any student of linguistics or human relations." "One of the world's finest sociolinguists, Suzanne Romaine, brings her profound knowledge and keen insight to bear on the question of sexism in language. Communicating Gender is wide-ranging and thoroughly researched, appealing to a broad array of feminist and linguistic authorities and sources as well as evidence from anthropology, sociology, history, literature, and popular culture. Covering both familiar and new terrain, the book serves as a readable and comprehensive introduction to the feminist study of language. Specialists will find the book an excellent resource, with a wealth of examples and an up-to-the-minute synthesis of a vast field. From pronouns to profanity, from science fiction to sexual harassment, Romaine's discussion reveals how linguistic structures enforce gender-based inequality--and what feminists have done and can do to dismantle the machinery of gender ideology in language." "An insightful and stimulating book, providing a cogent analysis of the role of language in constructing gender and in incorporating and perpetuating negative cultural beliefs about women. Through a well-researched and compelling discussion, the book deepens our understanding of the linguistic roots of women's oppression. Romaine tackles a remarkable breadth of topics from language acquisition to visions, through speculative fiction, into worlds without gender differentiation or inequality." "In this wide-ranging and passionately-written book, Romaine argues that gender is an inherently communicative process, and that communication is inherently gendered. Romaine provides evidence for her claims from a wide variety of languages, periods in history, and scholarly and popular writing. This is one of those rare books that is clearly written and engaging enough for the lay reader, argued tightly enough for the scholar, and that lays out the issues (with topics for discussion) in such a way as to be invaluable to the student." Contents: Doing Gender. Boys Will Be Boys? What's Gender Got to Do With Grammar? English--A Man-Made Language? What's in a Name? Gendered Talk: Gossip, Shop Talk, and the Sound of Silence. Learning How to Talk Like a Lady. Different Words, Different Worlds? Advertising Gender. Language Reform: A Msguided Attempt at Herstory? Writing Feminist Futures.